With Holy Week upon us, in less than a week's time we will move into a period of the liturgical year which will see churches festally decorated with floral arrangements. However, Easter -- like Christmas -- is a time of the liturgical year which, unfortunately, is seldom marked by particular restraint and, dare we say, good taste when it comes to the floral decoration of churches. Very often it becomes an exercise in quantity over quality. In our previous piece, Accenting the Liturgical Rites: Thoughts on the Tasteful Arrangement of Flowers in Churches, we spoke about this particular subject, including the tradition of cut flowers (not potted) where the altar itself is concerned; we also discussed matters such as proportions, colour, placement and so on. 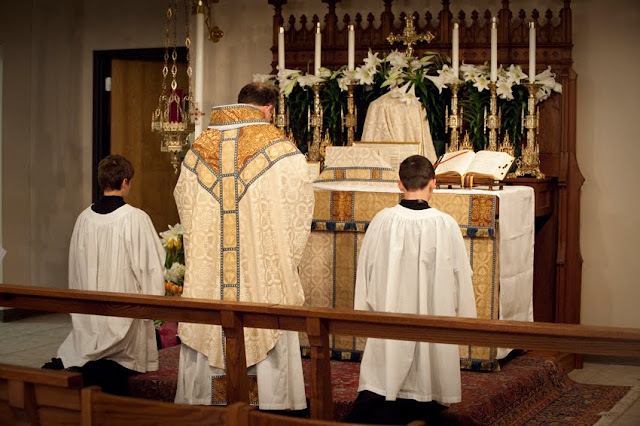 It was not so very long ago that we last spoke on this, and I would certainly invite readers to re-read that piece, but as we are about to embark upon this solemnity of solemnities, it seems like a pertinent time to re-consider some of these principles with a specific Easter focus as parish priests, sacristans and altar guilds think ahead to their festal preparations this Holy Saturday. It is pertinent to first consider one basic principle; one which can help guide our thoughts and practice in this regard, and that is the 'hierarchy' (visual and architectural) in our churches. ...to emphasize or bring into prominence some accessory feature at the expense of the principle and main object, or indeed to proceed so far as to subordinate the latter to it. 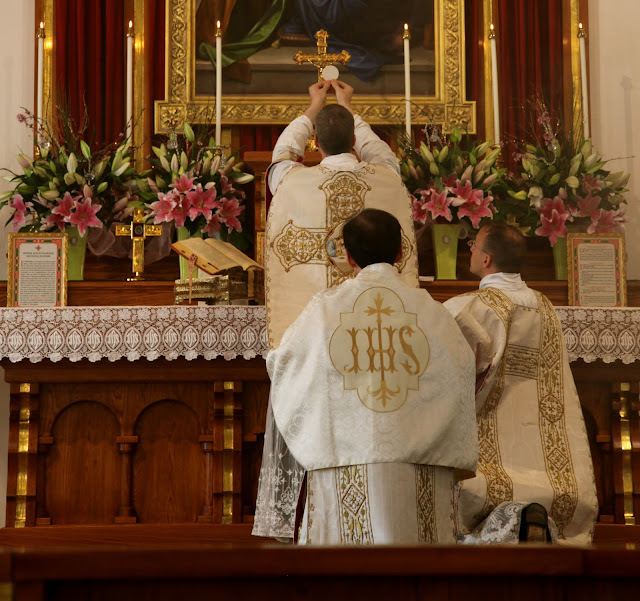 That principle and main object to which he refers is, of course, the altar. While Bishop had various considerations here in mind, one can certainly see how the issues that tend to occur in ecclesiastical floral decoration can certainly be understood in this same light. What then are the common issues? One of the most common issues in modern ecclesiastical floral arrangement (where freestanding altars are concerned) is the practice of placing flowers immediately before or around the altar, effectively making it a kind of backdrop rather than the central focal point. 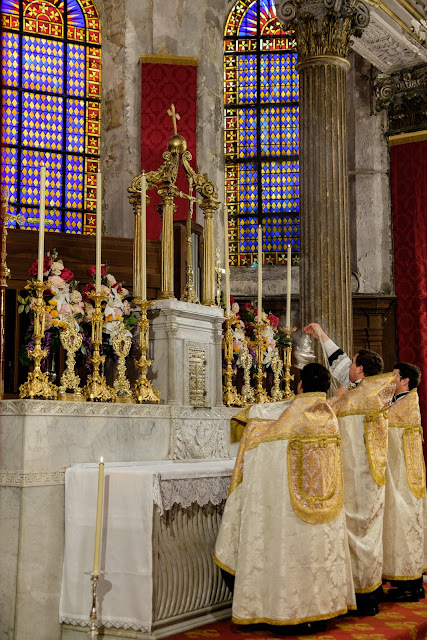 No doubt this desire is precisely rooted in the recognition of the importance of the altar, manifesting a desire to ornament it, but while this works rather well when an altar is oriented in the traditional manner, it doesn't work so well for an altar oriented versus populum. The effect it tends to have is precisely that which Edmund Bishop describes above. The altar becomes subordinate to the flowers -- and this is by no means desirable. The second issue, distinct but not entirely unrelated, is also the tendency to make quantity the focus. This is an issue which often affects freestanding and non-freestanding altars alike. In the case of the latter, the copious amounts of flowers placed on every square inch the gradine and reredos could offer, if not also the addition of extra candelabra and statuary, rather made the altar look like the church had been left derelict and nature had overtaken and overgrown her. In both cases, the problem is further exacerbated by a not uncommon practice of cluttering the rest of the sanctuary with the same. The third issue that presents itself is the matter of potted plants. Aside from the tradition in this area (which should be given serious consideration), potted plants almost never look proper on an altar, a gradine, a reredos or otherwise. Potted flowers do not aesthetically present the same as cut flowers do in how they arrange and they tend to look bulky and untidy especially in relation to an altar. If those are the issues, what then are the possible solutions? Proper placement and moderation are the key. In the case of altars with gradines, a tasteful restraint is best. In versus populum oriented altars, placements that crowd or obscure the altar should be avoided. They should be an ornamental accent to the altar; not in competition with it. Flowers near or on the altar or its gradines should be cut and placed into vases -- the height and 'weight' of the arrangements being dictated by the altar itself and its candlesticks. (This does not mean, of course, that there could not be uncut flowers elsewhere in the church, but for the altar and sanctuary it would seem best to maintain this tradition; a tradition that also happens to be the most aesthetically pleasing.) The altar and its cross and candles should always be the most prominent and should not feel suffocated by the arrangements. Finally, avoid the temptation to clutter your sanctuaries with too many flowers. Too many flowers in the sanctuary, again, tends to draw one's attention away from that which is central -- the altar. What should you do with the rest of the flowers that were ordered? Consider placing them in the narthex, or perhaps in the niches of statues along the nave. Not every flower purchased has to end up in the sanctuary; nor should it. The impact of a few well placed floral arrangements will be far greater and more effectual than a sea of them. Permit me to conclude by giving you just a handful of examples of arrangements that I think work very well. For a versus populum altar, one possibility can be seen here, specifically in relation to the two arrangements near the altar. This is by no means perfect in my estimation but it is tasteful. 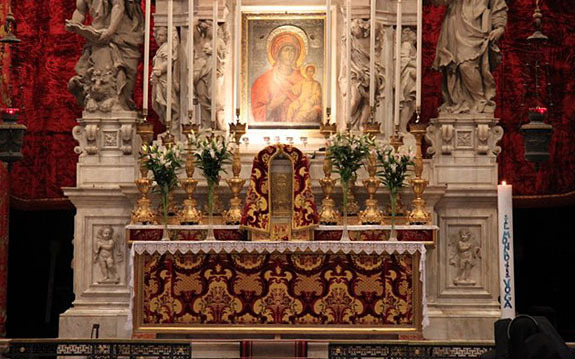 What I would particularly point out is their positioning in relation to the altar itself which is close enough to act as a kind of ornament to it, but without crowding or obscuring the altar. The use of flowers behind can also be effective and approximate, to some extent, an appearance similar to those shown in the photos above if done right. However, I would once again remind that cut form is the ideal here as potted will almost never satisfy the demands of good taste.